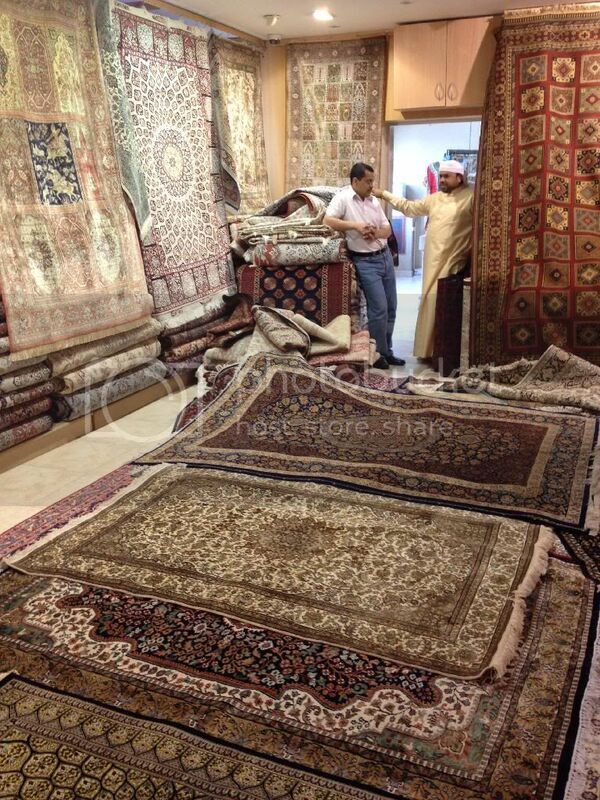 All Dubai expats at one time or another must make the pilgrimage to a local rug shop. 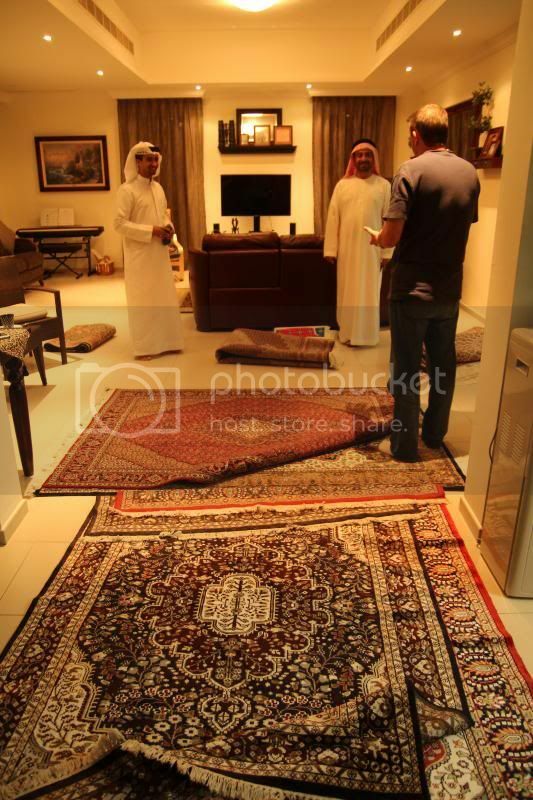 It's almost irreverent to live in the Middle East and not have some sort of encounter with the Oriental Rug. These richly patterned and uniquely handmade rugs are deeply woven into Middle Eastern culture. i started to appreciate their individual beauty at the beginning of our stay here when some expat wives were given a tour and lesson on how rugs are made. 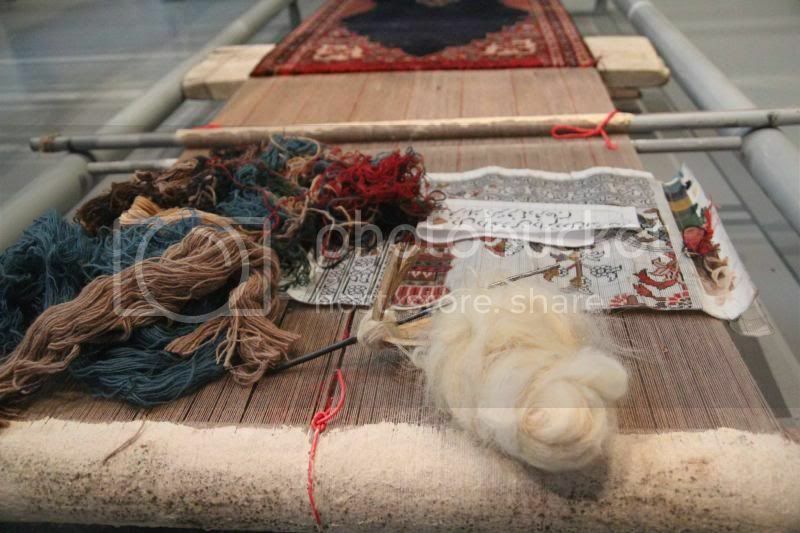 First off, genuine oriental rugs are all hand made on a loom using natural materials of wool, silk, cotton and sometimes even camel hair that have been colored with vegetable dyes. 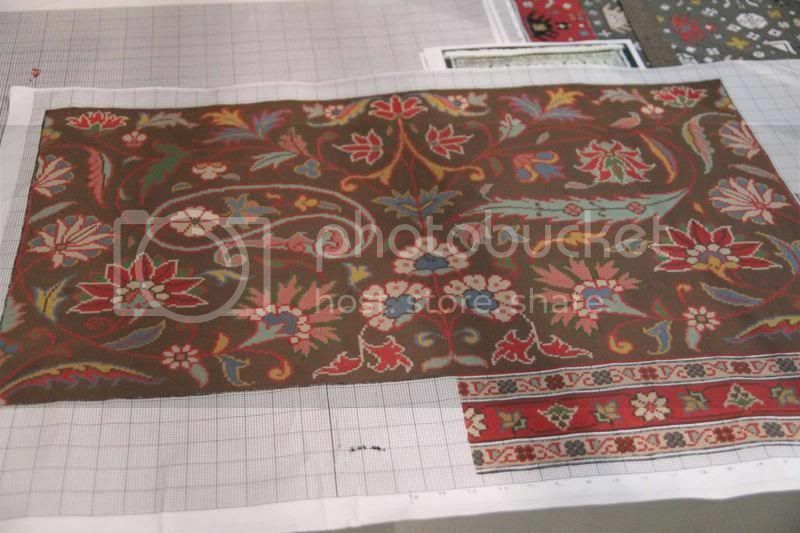 A pattern is drawn out and then hand knotted onto the loom. The waft & weft make up the rug as knots are tied to bring the rug to life. The more knots the the more detailed and clear the design. Think of it as a picture; the more pixels per square inch the clearer the picture. The test of a beautifully crafted rug is to flip it over. If the design on the back is as clear and beautiful as the design on the front, you've got yourself a piece of art. 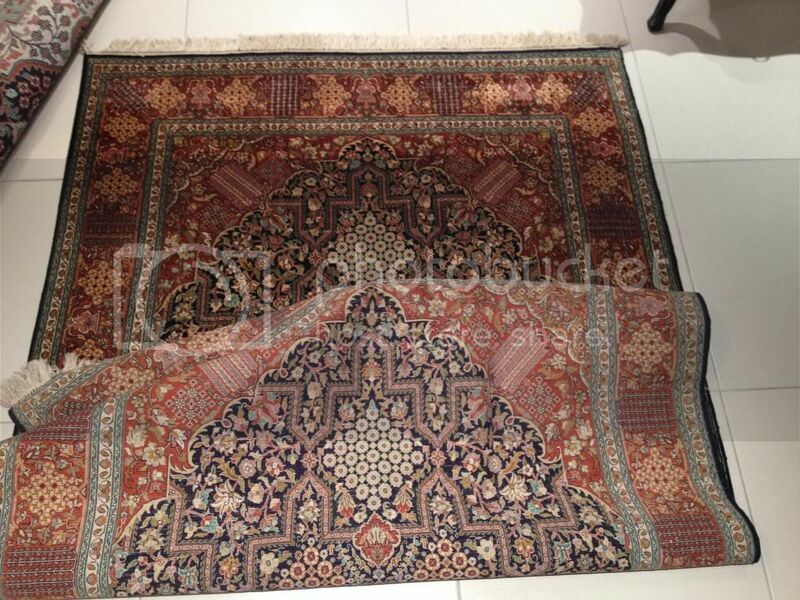 If you have enough cash lying around to purchase the ultimate rug; The PERSIAN Rug, you need to decide upon the color/scheme you are interested in for your home and purchase a carpet from specific regions in Iran. Rugs are very much like wine, the color, flavor, style and price is based upon the areas in which they are created. Varying budget and tastes can be accommodated. 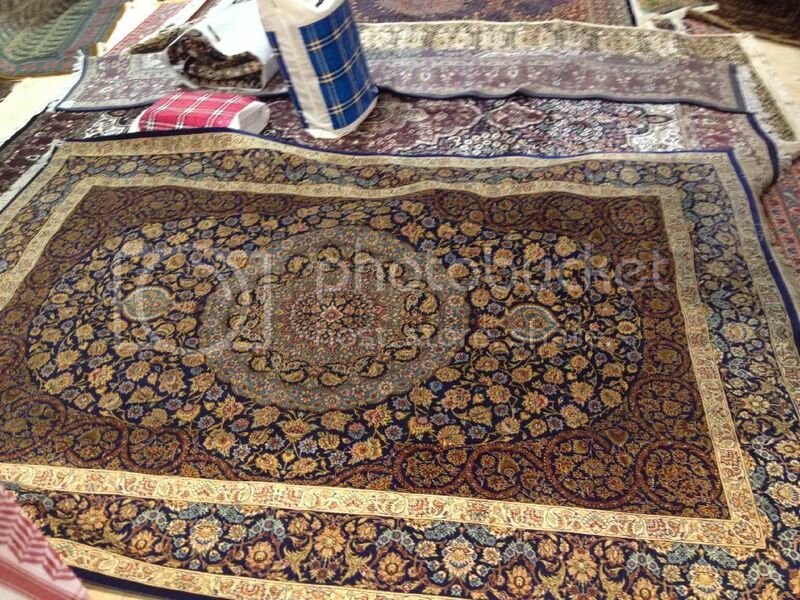 Persian silk rugs take years to make and are considered the top of the rug chain. They are distinguished by a signature of the area woven in at the base of the rug. i find the history and process of rug making so interesting but shopping for one is a whole other ride in and of itself. 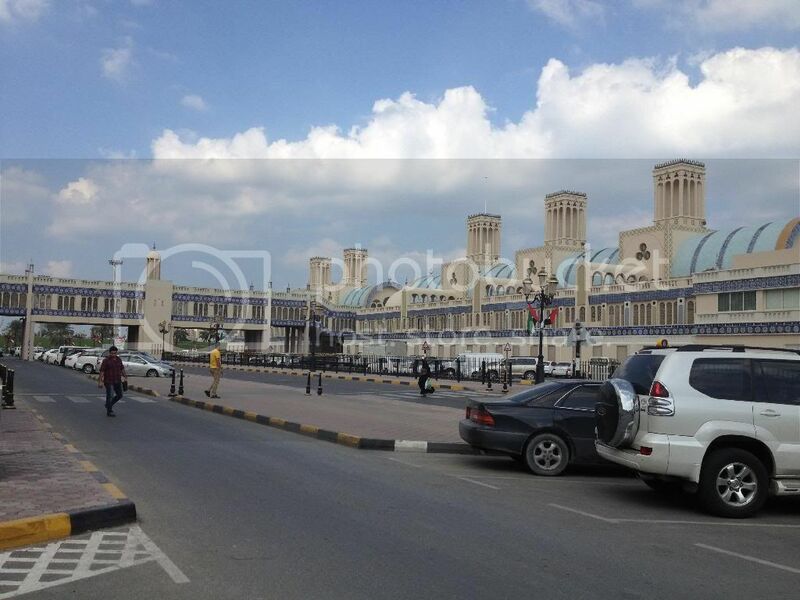 All serious rug shoppers head to the Blue Souk (market) for a purchase. Know from the start; if you walk into a rug store you will almost be guaranteed to go home with one. The shop owners start of with a friendly greeting in Arabic and bring you a delicious cup of tea. "As you like, " means we will serve it with milk, sugar, mint or plain. Whatever you want, we will bring it to you. This is Arabic hospitality. No business or discussion takes place until you are comfortable and have a warm or cool drink in your hands. As you settle into a cozy chair or perch yourself on a stack of folded rugs, the men start to unfurl rolls and rolls of carpets. They size you up for your general price range which will be haggled about later. Before you know it the floor is covered in 6 layers high and 3 carpets wide of wool, silk and cotton in the most vibrant colors and textures. 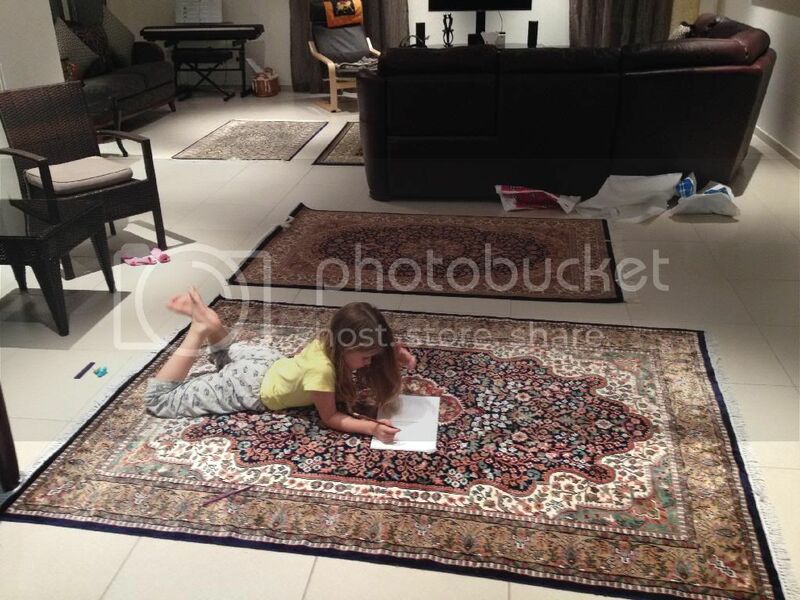 They want to know what you like and don't like about the size, feel, color, and pattern of the rug. If you don't like, you wave your hand away or say Khalas and within the time it takes to blink, one rug disappears and another one has magically replace it. As much as you wonder at the price of each they won't broach the subject until they know you LOVE a rug. 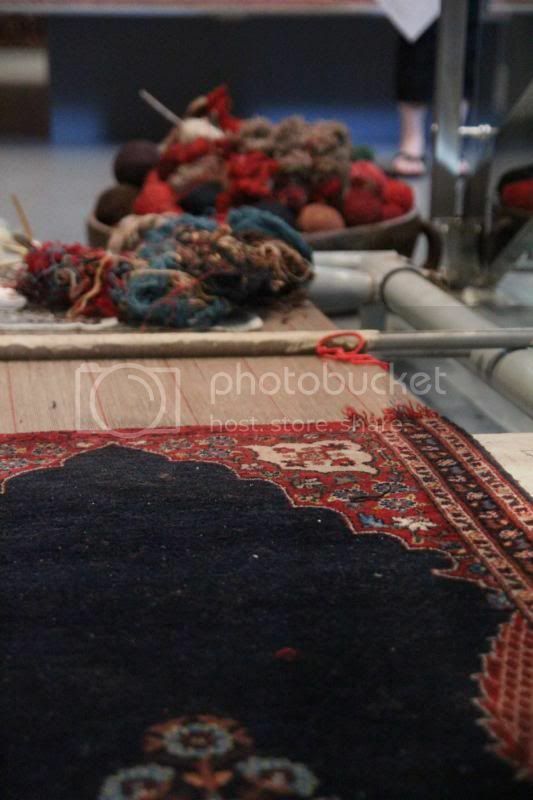 Here's the catch though, rugs are true pieces of art that change color in the light. Especially if they are silk. The way the thread dances through the carpet it plays on the light creating a light side and a dark side. 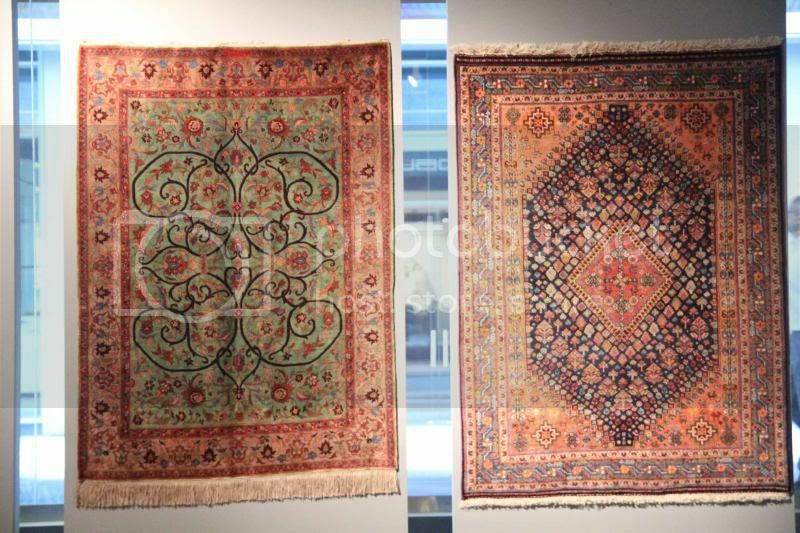 Depending on where you stand the rug may look like 2 completely different rugs. Because a rug may look one way in the shop and another way in your house AND because you want the rug investment to match our decor, shop keepers have no problem sending you home with 3, 4 or 5 different rugs to try out for days at a time. By that i mean; you can give them your mobile number, your approximate home location and leave their shop with rugs the price of small cars. No credit card, no deposit. NOTHING. They even wrap them and load them into the car for you. As i stated before, you are guaranteed to leave the store with one (or more) rugs. My budget was fairly thin by Blue Souk standards yet they sent me home with 2 that were very out of my budget and one that was so far out of my range i left like i had robbed a bank as i drove away. i assured them i couldn't possibly afford/buy the tiny sized Qum Persian rug but they insisted i take it home, look at it and show my husband. We unfurled them in our home that night just like the pros. The guilt of having 3 unpaid carpets in my house was starting to make me feel nervous. i called up Jalal, one of the owners and told him he could come pick them whenever he was free. He seemed in no hurry and said he would bring me even more to show my family when he had time. By the time he unloaded all the rugs he was breathing heavy from all the lugging back and forth from the van to my house. The carpets arrive folded up and all that is visible are the backs. 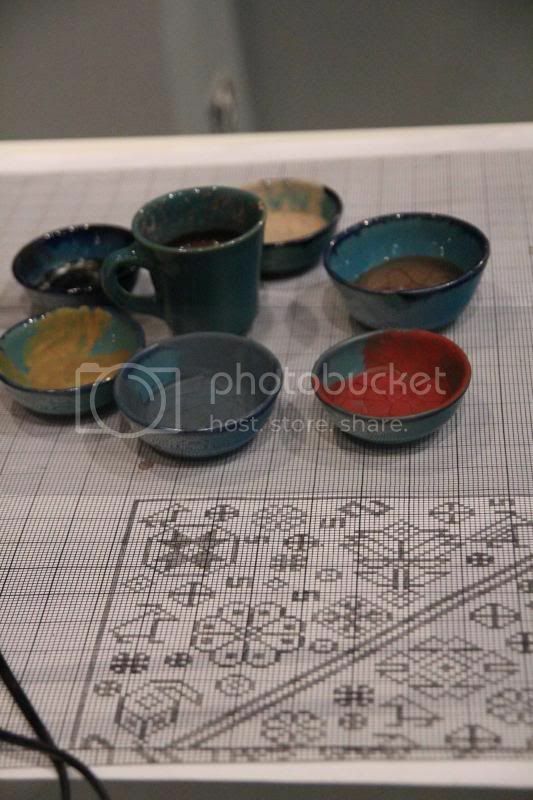 The crazy thing is when Jalal reaches for the folded up art, just before i hear the "whoosh ~ thud" sound the carpet makes as it sails through the air and hits the floor, i already have an idea of whether or not i'm going to like it based on the pattern i see on the back. Before i knew it Jalal transformed my house into his Blue Souk shop. After rolling and unrolling, furling and unfurling there was a finally a definite, "Whoa! Look at that one!" and only then did the back and forth haggling begin. "No, that is too much" was followed by "But what you ask, is too little." 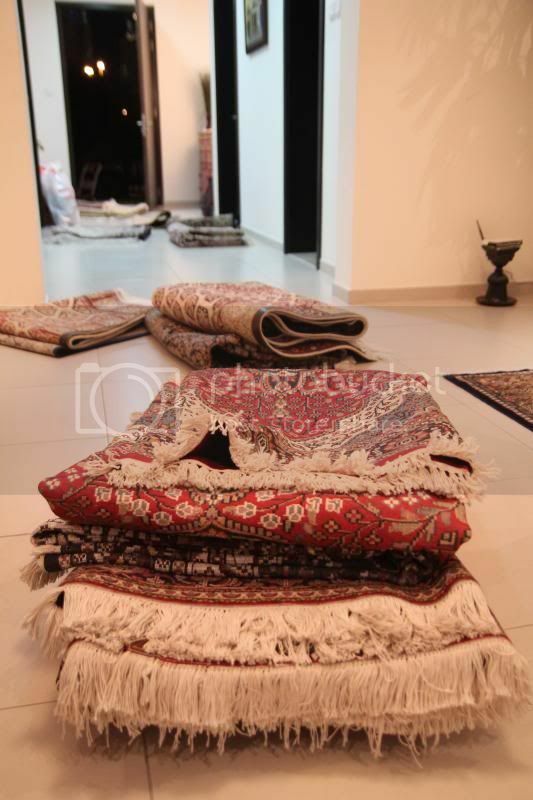 In the end Jalal and his cousin packed up his beautiful rugs and left my house. Any that may have been left behind are now rightfully ours. Okay son, I read your fb message first this morning. I was reading it, when I saw TJ's blog pop up. The great fortune you experienced yesterday, might deserve one more trip to the carpet store, for one more look at that favorite piece of art. after all, you are leaving, and your wife really would like "that one, remember" That will earn you so many at-a-boys. Enjoy your Thanksgiving day, since you can't work any way!! WOW! SO INTERESTING. It's amazing to read about the process... and hard to believe their trust (well-placed in you) that they would send them home with people. Your experiences are priceless. Thank you thank you for sharing them! Pops, check the bank account.....OUR BA. Damage done, wife and daughter happy. So, where's a picture of the rug that stayed behind? Did I miss it? I'm glad you were able to find one before you move! Great journey! These carpets are beautiful. 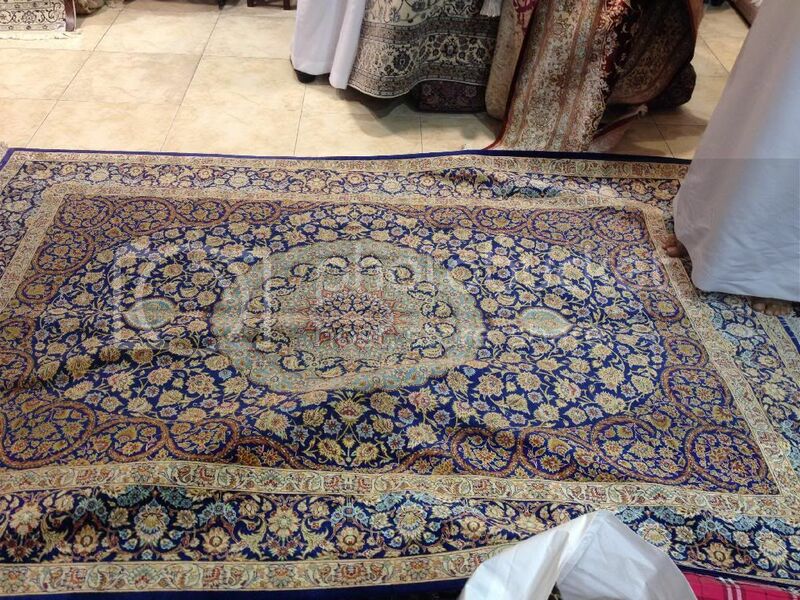 And if you wanna buy a silk carpet, Ievey carpet is gonna be your best choice.